I basically learned how to cook back in my 20s by reading issue after issue of Cooking Light. I’d page through, recipe by recipe, tearing out any and all that piqued my interest. Then, at the beginning of each week, I’d put my meal plan together and pick out which new recipes I was going to try. And during that time of cooking experimentation, I learned a lot. I made a lot of mistakes (I still cringe thinking about the blackened-to-a-crisp plantains I set our apartment fire alarm off with), I figured out the basics of how to cook a lot of staples, and — through trial and error — I got my cooking confidence and a number of go-to dishes that I still make from memory almost 15 years later. Including this gem of a recipe I’ve made my own over the years for African Chicken Peanut Soup. The original version of this recipe was published by Cooking Light back in 1999. Which is really dating myself. But, the original recipe is awesome. In fact, in the early 2000s I entered a soup competition at my work (these are the pre-FBG days) and won fan favorite for it. Since then though, I’ve gone gluten-free and I’ve really grown to love being creative in the kitchen. And that’s resulted in me taking the bones of this recipe and putting my own unique and gluten-free twist on it. And I have to say, the results are delicious. Maybe even better than the original? My husband thinks so. It’s made in the slow cooker! With no cooking required other than slow cooking. It takes 15 minutes of prep time and is a total no-brainer to pull together in the morning. It’s hearty, rich, filling and so delicious, while still being uber healthy. My husband demands I always make a double batch so that we have a ridiculous amount of leftovers. There’s kale in it — and you can really add as much or as little as you’d like. The recipe is super forgiving. Peanut butter and sweet potatoes give it that amazing sweet-and-salty flavor. Plus the kick from the spices? Oh, yeah. It’s great on its own, but you can also serve it over brown rice or cauliflower rice for a bowl that really satisfies. While my toddler daughter isn’t quite skilled enough to eat soup without making a huge mess, if I “de-construct” the soup so that it’s just pieces of chicken and sweet potato and black beans and kale? Well, she gobbles that up like whoa. You know those soups that taste even better the next day? This is one of those. 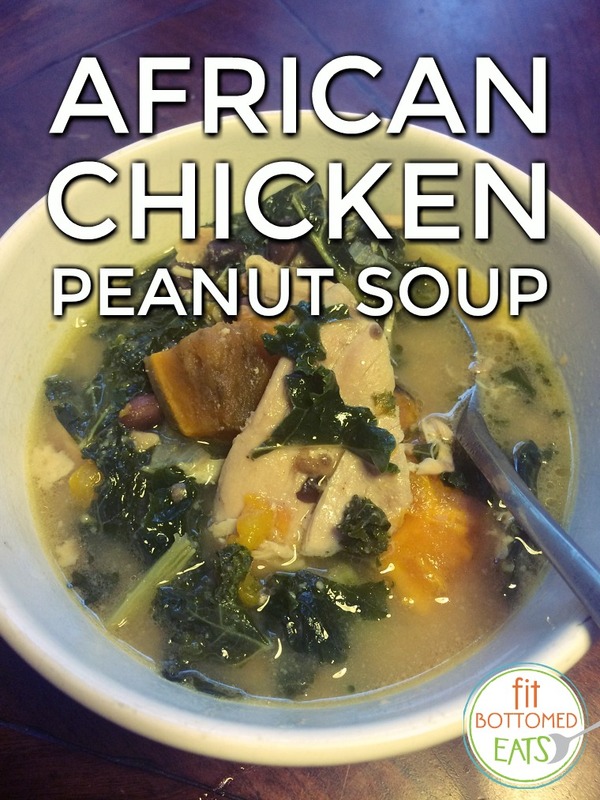 This African Chicken Peanut Soup is rich, filling and has a great sweet-and-salty flavor. Try it over brown rice or cauliflower rice for dinner tonight. Place ingredients (OTHER THAN kale, salt and pepper, and rice/cauliflower rice) listed above in a slow cooker. Follow the order listed so that your chicken is on the very bottom. Turn slow cooker on high for 6 hours. After 6 hours, stir, breaking up and shredding the chicken thighs (you can do this with a spoon or fork --- it should easily break apart). Then, add kale and add any necessary salt or pepper and cook on low for 1-2 more hours. Serve in bowls as is, or serve over brown rice or cauliflower rice. This sounds really good, altho I might leave out the beans since I’m not a big fan of those.